The EVERY DOOR DIRECT MAIL® Program that the United States Postal Service® is currently marketing is the best program to come out of the postal service in decades. You can print and mail your Every Door Direct Mail® campaign, all with a click of a mouse. 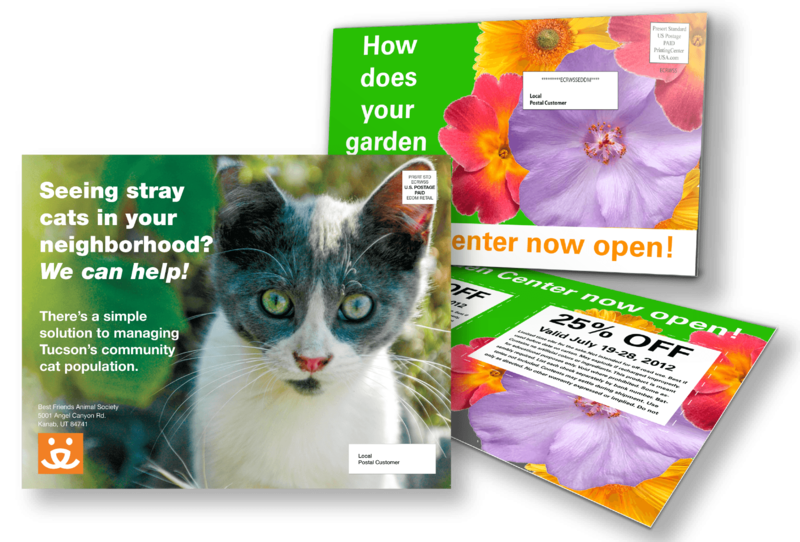 We offer Every Door Direct Mail® downloadable templates to help you get the right message to your customers and stretch your marketing dollar. We offer a full line of USPS Every Door Direct Mail® accepted size postcards and folded mailers that are guaranteed to meet USPS® regulations, and at a cost that won’t hurt your budget. Need help with a design or a marketing plan for your EDDM® mail piece? Maximize your return by contacting one of our specialists to walk you through the design, mailing, and ROI process for your mail piece. Our experts have experience and case studies to help you decide on the best offerings for your business, to elevate responses, and increase new leads and contacts for your business. Don’t have a design, don’t worry, our printing company provides a full service design. Turnaround time refers to the time it takes to produce an order after approval is received. Once you place your order, Prepress will review and assess your file to be print-ready. With your approval Prepress imposes your file for the press, the job is printed and goes to bindery where any number of additional processes take place (UV Coating, Binding, Folding, Trimming, Die-cutting, Hand Assembly, Inserting, Drilling, etc.) Once your job is complete it moves to the Shipping (or Mailing) department where it is prepped to ship (or mail). Turnaround time begins the following day from the day you approve your project and will be determined from what you selected when you place your order. . If you don’t like it you can cancel at any time before proof approval so you will NOT be stuck with a piece you don’t like. Create a USPS® Every Door Direct Mailer® 8.5x11 or a USPS® Every Door Direct Mail® Postcard (6.25x9 or 6x11) with our free online photo design tool. Start by selecting one of our free templates then start designing. Every Door Direct Mail®, EDDM®, Every Door Direct Mail-Retail®, and EDDM Plus are trademarks of the United States Postal Service®. PrintingCenterUSA is an independent provider of mailing and print shop services that is not associated, sponsored, or otherwise approved by the United States Postal Service to provide these services. As ALWAYS great service from start to finish !! The print quality and card stock quality are great...very pleased with that. I will definitely try printingcenterusa.com again, but there are a couple things I would like to see improved upon to be a loyal customer. I had the postcards shipped to my home and the packaging was cumbersome and inefficient. The 1900 cards arrived in one box, which weighed too much for me to carry into my house. The box was already ripped all along one side, probably from being so heavy. EDDM requires the post cards to be bundled in stacks of 50-100. Mine arrived in packages of 200 (actually 199) and 150, so I had to count out all 1900, which was really inefficient. It would be nice if they sent them packaged as 50-100 and labeled or with some notation. Printing Center was very helpful and very responsive to our concerns and needs. The product came when they said it would and it looked just as it should. Thank you!